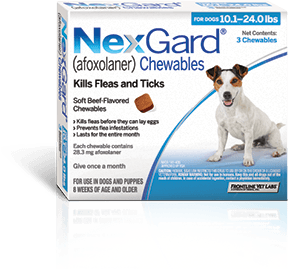 NexGard for Dogs kills adult fleas before they lay eggs to help prevent infestations. 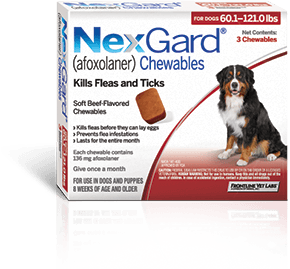 Plus, NexGard also kills the Lone Star tick, Black-legged tick, American Dog tick and Brown dog tick. 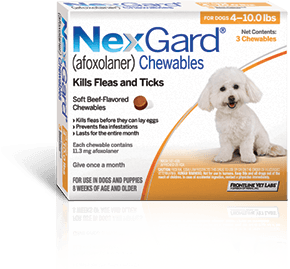 NexGard soft chew is FDA-approved, and proven safe and effective for use in dogs and puppies 8 weeks of age or older, weighing 4 pounds or more. 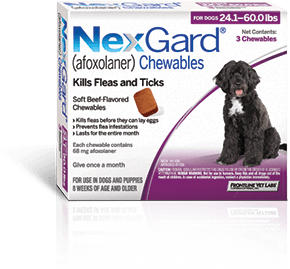 It contains an ingredient, afoxolaner, that kills both fleas and ticks quickly and keeps killing for a whole month.